Ruthiebear (Titusville, NJ, United States) on 22 May 2014 in Transportation and Portfolio. That was really a new modern invention. The details are amazing! Absolutely beautiful. I like how all the details are shown. Great work. Excellent treatment and composition. I like ! @Marie-France: I have missed you. Nice capture of the old wagon. Wonderful framing and nice textures. Beautiful light you capture to enhance the quality of this vintage wagon. C'est magnifique !!!!!!!!!!!!!!!! de très beaux détails de cette rouille . You have brought out amazing texture and Detail with the processing,good Frame. Superb photo . Great processing ! Beau traitement qui renforce le coté ancien de l'objet ! Beautiful treatment that reinforces the old side of the object! Great capture. I like the fantastic textures of wooden body and the beautiful rusty color. A fine image of this steel-wheeled cart. In looking at it I was wondering if it was normally pulled or pushed. Fine shot. @Don: I was trying to figure that out when I was taking the shot. THe handle made me think pulled, with that third wheel in the front also. Superb shot and fantastic treatment! I just love the texture and detail in that wood grain, matched with the rust on the wheels and it's just a treat. I think you did a great job with the saturation, it would have been so tempting to whack it up higher. Avec le jeu des rectangles de la baie vitrée, le chariot s'inscrit en volume dans la 3D ! A M A ZI N G ! Elle est superbe, je la verrai volontiers dans mon jardin. 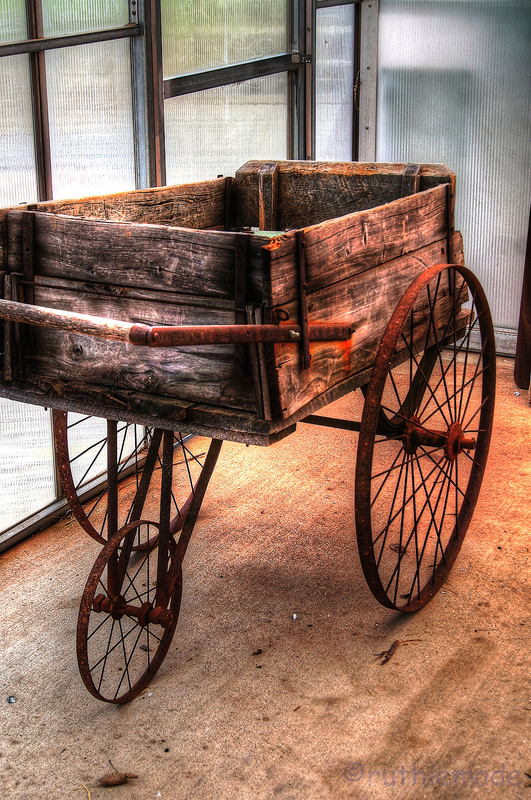 This is a lovely old wagon. I don't think I have ever seen one like this with 3 wheels. Beautiful old weathered wood. Wonderful color and detail. Fantastic treatment ! Great sharpness, clarity and textures. A cool three wheeled contraption. I like it. That wagon would look good in my garden. Can almost touch that rust . . love the presentation style. Very charming! Great texture and details in the wood planks! Catching up ... they are all great images, but so sad.